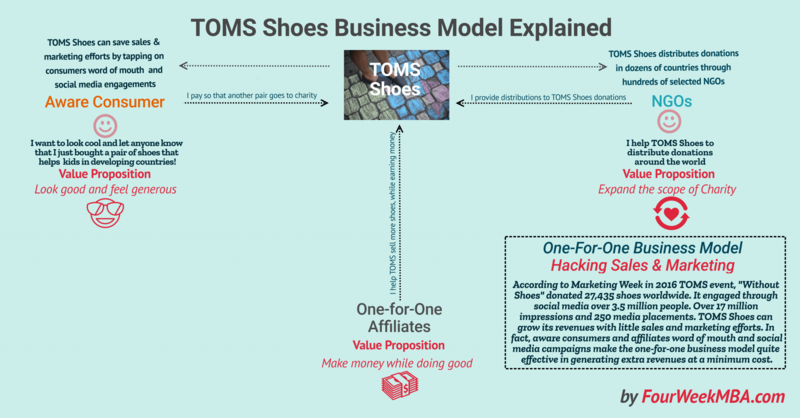 TOMS Shoes’ business model is called one-for-one. It means that for each pair of shoes sold, the company gives one pair back to kids in developing countries. The one-for-one model allows the company to monetize through consumers’ word of mouth and social campaigns, with a minimum effort in terms of sales and marketing. The one-for-one business model has become so crucial to TOMS success that the company trademarked it. How much money does TOMS shoes make? How much is TOMS shoes worth? What are the key partners and value propositions for TOMS shoes? Aware Consumers: I want to be cool and feel good! Toms (stylized as TOMS) is a for-profit company based in Santa Monica, California, that operates the non-profit subsidiary, Friends of Toms. The company was founded in 2006 by Blake Mycoskie, an entrepreneur from Arlington, Texas. The company designs and sells shoes based on the Argentine alpargata design as well as eyewear. According to an analysis made by Moody’s TOMS Shoes recorded net sales of $379 million for the twelve months ended March 31, 2017. In 2014, private equity firm Bain Capital purchased a 50% stake in the company, valuing the company at $625 million. The value proposition is straight, simple, yet powerful: improve the lives of millions of people around the world while creating a for-profit sustainable business model, based on a fashionable product (shoes in this case) for aware consumers. The simple value proposition attracts aware consumers (those concerned about sustainable causes): for every product purchased, one is given away to a person in need. That makes the purchase more appealing to consumers that want to look fashionable while giving their contribution to developing countries with a simple purchase. That makes donating simple for everyone. In fact, TOMS Shoes takes care of setting up partnerships around the world with NGOs to allow the distributions of the free supplies. TOMS gives away shoes and other supplies and services in over 60 countries and works with hundreds of NGOs to distribute the donations. The partnership with NGOs is critical to TOMS’ business model success as it allows the company to stay consistent with its mission, which makes the company’s products appealing to aware consumers. Affiliates can apply to the affiliation program directly from TOMS website. They give support for updates, links, and banners for TOMS products. Including a full array of products including limited edition styles. Also, they get promotional links in a variety of sizes and unique creative including web banners, logos, and text links. In 2016 at TOMS’ charity event, Without Shoes, the company donated 27,435 shoes to children worldwide, as reported by Marketing Week. From that campaign more than 3.5 million people were engaged; While over 17 million impressions were generated with the hashtag #WithoutShoes. Those social media campaigns secured to TOMS over 250 media placements. According to a 2009 CNBC show, it only costs TOMS $9 to produce each pair of shoes. If we take this number for good, this means that 27,435 at a $9 per unit, the cost to TOMS was $236,915. Taking into account the revenues for 2017 at $379 million, that means TOMS donation budget was 0.06% compared to net sales. If we compare the marketing and sales budget of companies like Nike this is way higher. In fact, in the second quarter ended November 30, 2017, reported a demand creation expense (sales & marketing) of $877 million. The revenues for the same period was $8.6 billion. That makes the sales and marketing cost at 10.20% over the net sales ($877 million / $8.6 billion). Therefore, if we takeTOMS’ donation budget to revenues in 2016 at 0.06%. Then compare that with Nike’s sales and marketing budget in proportion to sales for 2017 that is 10.20%. Therefore, the latter spends almost 170 times more in marketing budget (assuming the donations can be considered as marketing budget for TOMS)! A little caveat: The numbers above are based on estimates and numbers found on the internet. For how much I fact checked those numbers, TOMS is not a listed company. Therefore, numbers might turn out to be inaccurate. The main point here is that TOMS with the one-for-one business model, it managed to create also financial value and what seems to be sustainable profits over time. Therefore, it proved to be effective from an economic standpoint, beyond ethical valuations. TOMS Shoes was created by Blake Mycoskie, which came up with the one-for-one business model after traveling in Argentina when he found out kids were so poor that they couldn’t afford shoes. He decided to start a sustainable business model based on the principle of donating a pair of shoes for each pair of shoes sold. This business model has proved effective. In fact, in the last twelve months ended in March 2017, the company recorded $379 million in sales. Also, back in 2014, Bain Capital purchased 50% of the company, placing the valuation at $625 million. The value proposition involves three key partners: consumers, NGOs, and affiliates. Consumers that want a fashionable pair of shoes at an affordable price; while feeling they’re improving someone else lives are attracted by TOMS’ value proposition. NGOs are selected from time to time to distribute TOMS donations. While affiliates are recruited to help the company distributes its products even further. The business model has proved quite effective. In fact, the effort for the donations of shoes makes up for the momentum gained in sales. According to the estimates above TOMS Shoes donations effort for 2016, compared to net sales for 2017 was only 0.06%. Compared to Nike’s sales and marketing spending at 10.20% of total sales. That makes TOMS one-for-one way more effective than traditional business models! Veey great article! Have you read a book how everything is started? It is an amazing story how company with a great story can rise so quickly! Thank you Gedas! And yes I read the book from Blake Mycoskie. Definitely a must-read!